In April I wrote about my new Lao T-Shirt. The shirt says, in Lao, that I'm learning Lao and would like anyone who can understand my shirt to speak to me. I've worn the shirt about five or six times. Most of those times have been disappointing. But finally, it worked! I was watching the Western Festival Parade in Elk Grove last month, when one of the people in the parade who was walking down the side of the road handing out candy saw my shirt and started talking to me in Lao. Well, sort of. I froze mentally, and couldn't remember much Lao. It was pretty exciting though. A few people have suggested places locally where I might meat more Lao people, so I hope to visit there soon and practice more Lao. I've whined before about how few quality resources there are for learning Lao on the internet. Well, I did find a site that has free e-books to download in Lao and English. I downloaded one with Sherlock Holmes stories. It's slow reading, but kinda fun to read something I'd never expect to read in Lao. It's been a year since the Esperanto in Six Weeks challenge that got this blog started. For the most part I've put Esperanto aside while I've studied Lao. Well for two reasons I've put aside Lao for the past couple of weeks and picked up Esperanto again. The biggest reason is that Duolingo added Esperanto to their list of courses. I wish it existed last year while I was learning. If you want to learn Esperanto, this is, in my opinion, the best resource out there. For the past two weeks I've been strengthening my Esperanto tons. The second reason is I found the Esperanto Society of Sacramento. Actually, they found me. A while back Amanda Higley Schmidt sent me an email after she found my video on YouTube talking about my hometown in Esperanto. I've been unable to attend any of their meetings, because they are always on Sunday. I talked to Amanda on the phone a few times last month, and Amanda agreed to change their June meeting to a Saturday so I could attend. I loved it. The Esperanto Society of Sacramento is a pretty small group, but they are some of the nicest people I've ever met. And two hours of speaking (mostly) Esperanto helped me more than I would have expected. I'll be back for their July meeting. One last thing to report on. 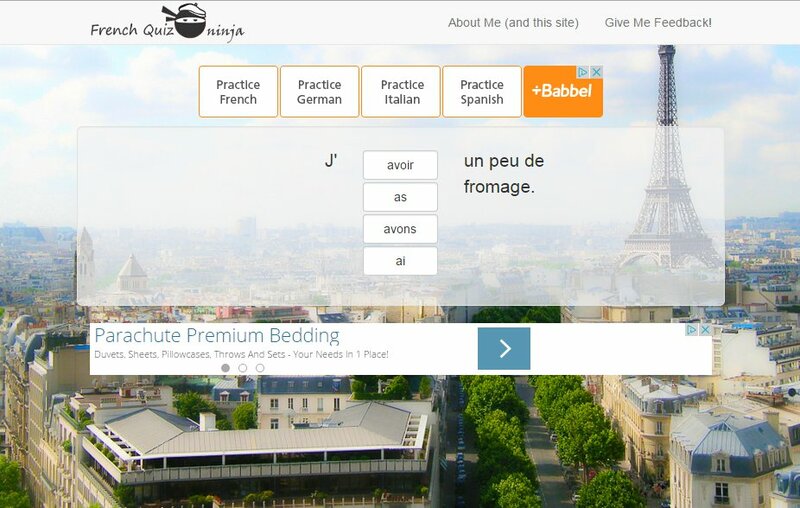 This past week I created a new site for practicing French verbs. It's far from complete, but I'm proud of it so far. I'd really love feedback on it. The site is set up as a quiz site. My short-term goal is to have the 100 most common French verbs to practice. Currently I have about 8 or 9. The logo is almost my favorite part. Check it out, give me feedback, and happy language learning! Congrats on your new French site. I hope it does well for you!